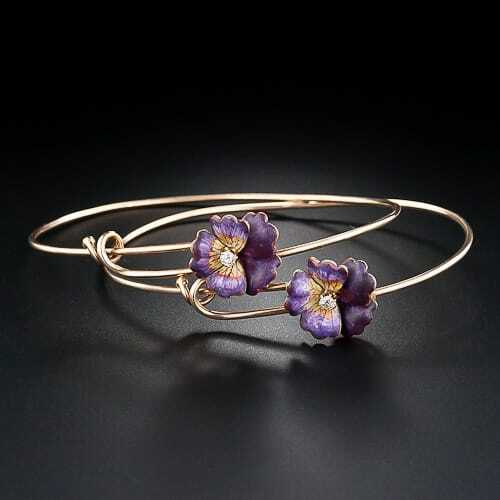 Victorian Enamel and Diamond Pansy Bracelets, Pansies Symbolize Purity. Billet-doux translates from the French as “sweet note” or “love letter.” The term was introduced into the English language by William Makepeace Thackeray in his novel “Vanity Fair” – 1848. Coded messages between lovers were posted in the newspaper in order that they not be intercepted by anyone other than the intended. A more public form of billet-doux was a jewelry item designed as a floral bouquet composed to relay a secret message to a forbidden loved one. The flowers were used symbolically; roses for love, pansies for remembrance, daisies for purity and so on. Gemstones could be used to spell out messages in an acrostic composed of the first letter of each gem name. Eye miniatures, silhouettes, hairwork and coded engravings all served as forms of billet-doux.